The many portraits in Hall are detailed below wall-by-wall and larger images of each can be explored in the Gallery section at the bottom of the page. Further information on many of those whose portraits are listed below can be found on the Oxford Dictionary of National Biography website and several, especially the Masters, are further detailed in Robin Darwall-Smith’s, A History of University College, Oxford, which is available online from Blackwell’s. The Hall is also currently home to a large number of photographic portraits that celebrate the diversity of careers that our alumni enjoy. Find out more about these on our Young Univ Gallery page. 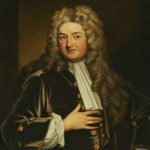 At the top: John Radcliffe (1650–1714). Undergraduate of Univ, matr. 1666 (Artist: Anon. after Kneller). 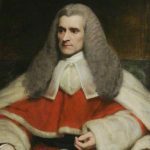 Known for his entertaining bedside manner, he became a successful and very wealthy doctor (he attended both William III and Queen Anne). He bequeathed money to Univ to build what is now Radcliffe Quad, and to create two Fellowships in medicine. He also gave the University the money to build the Radcliffe Camera, the Radcliffe Infirmary, and the Radcliffe Observatory. 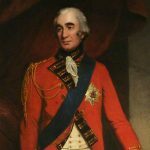 Directly below preceding: Sir Roger Newdigate (1719–1806). Undergraduate of Univ, matr. 1736 (Artist: Thomas Kirby after George Romney). MP for Oxford University from 1750–80. As MP, he was a stout Tory, and a regular defender of the University’s interest. He was also an early patron of the Gothic Revival, and helped have Univ’s Hall redecorated in the ‘Gothick’ manner in 1766 (these changes were reversed in 1904). He also endowed the Newdigate Prize for poetry. To the spectator’s left, at top: John Scott, Earl of Eldon (1751–1838). Undergraduate of Univ, matr. 1766, and Fellow 1767–73 (Artist: William Owen). He is the youngest known Fellow of Univ, being elected aged 16, and he is one of only two undergraduate Fellows of Oxford since 1660. 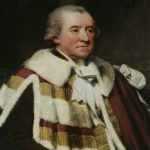 He became Lord Chancellor of Great Britain from 1801–6 and 1807–27 (the longest-serving holder of this post), and became notorious and famous in equal measure for his reactionary Tory views. William Scott was his brother. To the spectator’s left, below: Francis Rawdon Hastings, Marquis of Hastings and Earl of Moira (1754–1826). Undergraduate of Univ, matr. 1771 (Artist: John Hoppner). Soldier and statesman, who fought in America during the War of Independence. In 1813–24, he was Governor-General of Bengal. To the spectator’s right, at top: William Scott, Lord Stowell (1745–1836). Fellow of Univ from 1765–82 (Artist: John Hoppner). 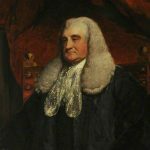 Remembered as one of the best tutors of his generation in Oxford, Scott left Univ to enter the law, and worked in the Admiralty and Ecclesiastical courts, where he acquired a considerable reputation. 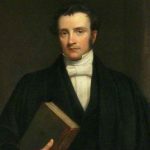 He was also MP for Oxford University in 1801–21. Through Robert Chambers (see below, North Wall here), he became a close friend of Dr. Johnson. John Scott was his brother. To the spectator’s right, below: Charles Jenkinson, Earl of Liverpool (1726–1808), Undergraduate of Univ, matr. 1746 (Artist: Anon. after George Romney). 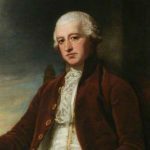 He became one of the great political behind-the-scenes ‘fixers’ of his generation, especially in the 1760s and 1770s, when he was thought to possess considerable influence with George III, and he was a member of the Cabinet for much of this period. Nearest east end, at top: John Potter (1674–1747). Undergraduate of Univ, matr. 1688 (Artist: Anon, after Hudson). 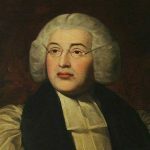 Although he came to Univ as a servitor (so poor that he had to carry out servant’s duties to help pay his way), he rose through the ranks until in 1737 he became Archbishop of Canterbury – the only Univ undergraduate appointed to this post. Nearest east end, below: John Bancroft (1574–1641). Master of Univ 1610–32 and Bishop of Oxford 1632–41 (Artist: Anon.). A good and efficient Master, Bancroft was a friend of William Laud and fully supported his High Church policies, and opposed to the Puritans. Perhaps fortunately, for him, he died just before the English Civil War broke out. 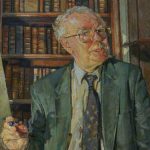 In the top-left hand corner of the portrait is the palace which he built at Cuddesdon for Bishops of Oxford to live in. It was destroyed in the war. To spectator’s left of fireplace, at top: George Horne (1730–92). Undergraduate of Univ, matr.1746 (Artist: Thomas Olive). 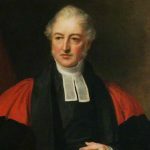 Horne became a Fellow and then President of Magdalen, and then Bishop of Norwich, just before he died. 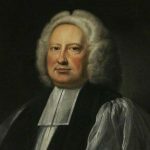 He was well known in his lifetime as a theologian who supported the Church of England against attacks from methodism. He was also much liked for his good nature. To spectator’s left of fireplace, below: George Abbot (1562–1633). Master of Univ 1597–1610 and Archbishop of Canterbury 1611–33 (Artist: Anon.). He was part of the team which translated the Gospels, the Acts of the Apostles, and the Book of Revelation for the Authorized Version of the Bible. 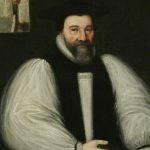 His time as Archbishop was overshadowed by an unfortunate event: in 1621 he accidentally shot and killed a gamekeeper when out hunting, and in his later years he was effectively ignored by Charles I, who preferred the religious policies of Abbot’s eventual successor, William Laud. 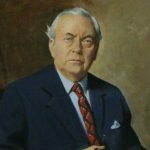 Above fireplace to left: Harold Wilson, Lord Wilson (1916–95), JRF and Fellow of Univ 1938–45 (Artist: Cowan Dobson). UK Prime Minister 1964–70 & 1974–6. The only British Prime Minister since 1900 to have won four general elections. 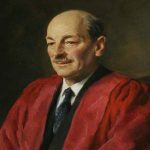 Above fireplace to right: Clement Attlee, Earl Attlee (1883–1967). Undergraduate of Univ, matr. 1901 (Artist: Sir Oswald Birley). UK Prime Minister 1945–51, whose government saw the creation of the welfare state. He is generally considered one of the most important peacetime Prime Ministers of the 20th century. The only Univ undergraduate to become Prime Minister. To spectator’s right of fireplace, at top: Bob Hawke (born 1929). Rhodes Scholar at Univ, matr. 1953 (Artist: Robert Hannaford). 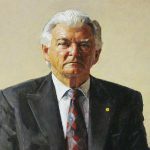 Prime Minister of Australia 1983–91. His most famous/notorious act when at Univ was to drink two and a half pints of beer in the fastest time ever recorded – eleven seconds. To spectator’s right of fireplace, below: Festus Mogae (born 1939), Undergraduate of Univ, matr. 1965 (Artist: David Cobley). President of Botswana 1998–2008. One of three Univ men to have been heads of government in Africa – the others were in Ghana and what used to be Rhodesia. 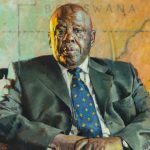 Mogae is generally regarded as one of the most successful African leaders of his generation: he has been praised for his good governance, and for his work on HIV/Aids. To spectator’s right of oriel window, at top: Reginald Walter Macan (1848–1941), Undergraduate of Univ, matr. 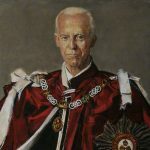 1868, Fellow of Univ 1884–1906, and Master of Univ 1906–23 (Artist: Maurice Grieffenhagen). Macan was primarily an ancient historian, who wrote on Herodotus. As a younger man, he had been obliged to leave Christ Church on account of a book on the resurrection which was thought heretical. In later years he became much more conservative in his ways. Note: there is currently no entry for Reginald Walter Macan in the ODNB. To spectator’s right of oriel window, below left: James Franck Bright (1832–1920). Undergraduate of Univ, matr.1850, Fellow of Univ, 1874–81, and Master 1881–1906 (Artist: Sir George Reid). Bright was a historian, who studied the 18th century. 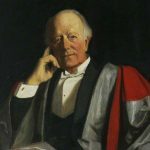 In the early 1880s he was one of the very first academics in Oxford to allow women students to attend his lectures, which were held in Univ’s Hall. He is also the only Master to have been the victim of an attempted murder. In 1892, he was shot by a woman who had been jilted by his daughter’s fiancé. 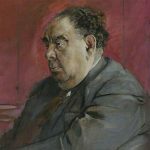 To spectator’s right of oriel window, below right: John Maud, Lord Redcliffe-Maud (1906–82): Fellow of Univ 1929–39 and Master of Univ 1963–76 (Artist: Ruskin Spear). He had a successful career in the Civil Service, and became chairman of the committee which redrew Britain’s county boundaries in the early 1970s. He and his wife (who was a concert pianist) founded the Univ Music Society in 1930. To spectator’s left of window, at top: Helen Cooper (b. 1947). Fellow of Univ 1978–2004 (Artist: June Mendoza). 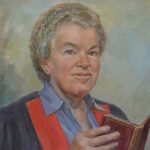 Univ’s first woman Fellow, Helen Cooper arrived in 1978, a year before the first women students here. She is a leading authority on medieval English literature, especially the works of Geoffrey Chaucer. From 2004–14 she was Professor of Medieval and Renaissance English at Cambridge. 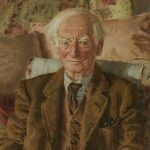 To spectator’s left of window, William Beveridge, Lord Beveridge (1879–1963), Fellow of Univ 1902–9 and Master 1937–45 (Artist: Alan Gwynne Jones). During his Mastership he wrote the Beveridge Report, which proposed the creation of a welfare state in Britain. He was also remembered in the College for his formidable wife. 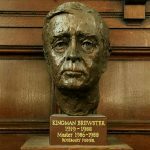 Below window, to spectator’s left: bust of Kingman Brewster (1919–88), Master of Univ 1986–8 (Sculptor: Rosemary Fisher). President of Yale in the 1960s, when his sensible leadership ensured that Yale was spared the student upheavals suffered elsewhere in the USA at this time, and Ambassador to the UK under President Jimmy Carter. 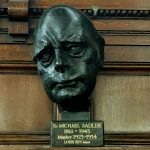 Below window, to spectator’s right: bust of Sir Michael Sadler (1861–1943). Master of Univ 1923–34 (Sculptor: Loris Rey). Best known in his day for his work as an educational theorist (he was especially interested in how to make university education more widely available), he was also an enthusiastic patron of modern art: he was among the first Britons to purchase works by Cezanne and Van Gogh, and he filled the Master’s Lodgings with his collection. To spectator’s right of window, at top: Arthur Lehman Goodhart (1891–1978), Fellow of Univ 1931–51 and Master 1951–63 (Artist: Middleton Todd). 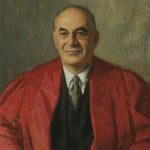 The first American and the first Jew to be elected head of an Oxford College, Goodhart was also a very distinguished academic lawyer, who edited the influential journal the Law Quarterly Review for many years. He was a great benefactor to the College, paying for the creation of the Alington Room and the construction of the Goodhart Building. His sister, Helen, helped pay for Helen’s Court. To spectator’s right of window, below: Arnold Goodman, Lord Goodman (1913–95), Master of Univ 1976–86 (Artist: Graham Sutherland). Goodman was a famous solicitor, who had many eminent clients, including Harold Wilson. He was also an important patron of the arts, supporting, among other organisations, English National Opera, and helped create the Open University. Nearest west end, at top: Sir Robert Chambers (1737–1803). Fellow of Univ 1761–75 (Artist: Robert Home). 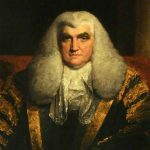 He became a lawyer, and went out to India, where in 1789 he became Chief Justice. 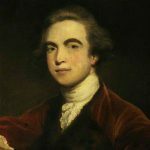 He was also a good friend of the great lexicographer and man of letters, Samuel Johnson, and thanks to him Johnson became a regular and welcome visitor to Univ right up until his death in 1784. Nearest west end, below: William Windham (1750–1810), Undergraduate of Univ matr. 1767 (Artist: Sir Thomas Lawrence). A politician, he was War Secretary for much of the 1790s, and so played a leading role in prosecuting the war with France. He also did much to improve the organisation and finances of the British army. To spectator’s right of preceding, at top: Arthur Penrhyn Stanley (1815–81): Fellow of Univ 1838–51 and Dean of Westminster 1864–81 (Artist: Eden Upton Eddis). 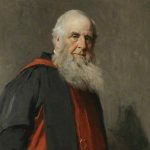 A leading liberal theologian of his day (and possibly Queen Victoria’s favourite clergyman), Stanley was a brilliant tutor at Univ, who improved academic standards and supported university reform. He was also the first biographer of Thomas Arnold, and some think that the character of little Arthur in Tom Brown’s Schooldays is based in part on Stanley. To spectator’s right of preceding, below: Frederick Charles Plumptre (1796–1870). Undergraduate of Univ, matr. 1813, Fellow of Univ 1817–36, and Master of Univ 1836–70 (Artist: Eden Upton Eddis). Although he was not unsympathetic to change, his essential conservatism mean that he was eventually overtaken by more radical reformers. 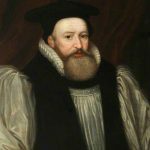 He also disapproved of the Oxford Movement, and he laid the foundation stone for the Martyrs’ Memorial in St. Giles ,which was intended as a riposte to it. He was, however, an early supporter of the study of science, and gave money towards the construction of the University Museum. Note: there is currently no entry for Frederick Charles Plumptre in the ODNB. To spectator’s left of window, at top: Jacob Bouverie, Earl of Radnor (1750–1826), Undergraduate of Univ, matr. 1767 (Artist: John Hoppner). 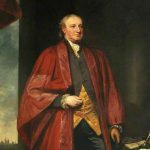 An MP until he succeeded to the earldom in 1776, Radnor spent his life running local militias, and involving himself in politics. He was also Lord Lieutenant of Berkshire. He was a generous patron of the arts, building a Council Chamber at Salisbury in 1796. To spectator’s left of window, below: Sir John Richardson (1771–1841). Undergraduate of Univ, matr. 1789 (Artist: Thomas Phillips). 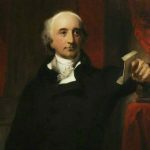 He was Puisne Judge of Common Pleas in 1818–24. 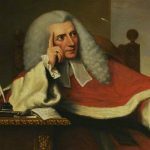 He later moved to Malta for health reasons, and drafted a law code for that island. In between the two windows: John Albery (1936–2013). Fellow of Univ 1963–78, and Master 1989–97 (Artist: Daphne Todd). An eminent scientist (the first FRS to become Master), Albery also had a literary bent, writing sketches for That Was the Week That Was. Note: there is currently no entry for John Albery in the ODNB.